Roue étroite supplémentaire pour les patins des enfants avec une lame étroite. La roue a seulement 2 cm de large. Utilisation sans espaceurs en raison de la charge minimale. Attention ! Cette roue n'a que 2cm de largeur. Ne fonctionne pas avec des entretoises. Ce produit correspond bien à sa description dans le catalogue et à l'utilisation que j'en attendais. Le produit est conforme à sa description et répond totalement à mes attentes. Livraison effectuée selon les délais annoncés. Un service Pro ! Je recommande !!!! Wonderfull ! I used it with new bearing and axle to repare my old pilot case. I'm succesfull and this avoid me to buy a new one. Good for the planet and for my wallet ! 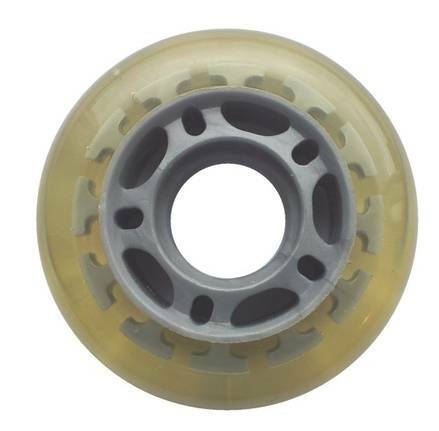 I bought those wheels to replace some plastic ones which came with inline skates for children, from a supermarket. They are soft, which makes skating with them much more comfortable. The price is also interesting, slightly less expensive than some wheels I saw on eBay. Otherwise, the shipping was fast. Very good wheel,nice grip and cheap. Service from Skatepro is brilliant. Fantastic service and great delivery. Good quality replacement wheels for my Brics wheeled suitcase, arrived on time. I bought two wheels as a replacement for my Pelicase. Now it runs soft and smooth. Maybe they need to be a bit more wider in diameter to be perfect, but I'm happy for now. Very pleased with these junior wheels. I used them as a replacement for a Samsonite cabin luggage, and it works even better than with the original ones (also were much more chaper).